TesTex NDT provides a comprehensive drone inspection service using professional unmanned air systems (Drones) equipped with the latest technology. Drones provide a cost effective, safe and fast solution for many inspection needs. Example of an image captured via drone, during visual inspection of a column. 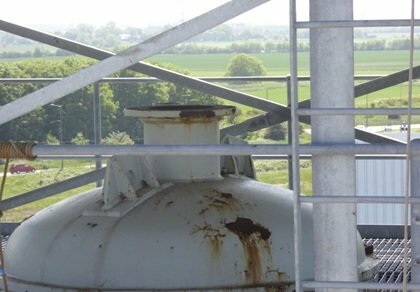 Our Drone Inspection Services delivers aerial inspections across a range of industries and assets such as tanks and pipework which can normally only accessed via scaffold or MEWP. The drones give our experienced EEMUA 159 or API 570 technicians the visual inspection in real time on which they are able to assess and make recommendations and decisions on your assets. Aerial imagery is provided in both still and 4K video, inspection data, live video feed, thermal imaging, panoramic stills and 3D models. Drone operators are fully qualified, licensed, insured and operate using the latest secure web-based flight management systems to ensure both best practice as per CAA regulations and consistency in flight operations amongst our team.